The School of Veterinary Medicine and Biomedical Sciences (SVMBS) strives to create a work environment in which faculty and staff are valued for their contributions and treated with respect, courtesy and fairness. The Workplace Culture Task Force (WCTF) will recommend actions to help promote greater trust, communication, collaboration and professionalism among ALL employees of SVMBS. After a summer break, the Workplace Culture Task Force (WCTF) met on Sept. 8, 2017. The first item of business was the fall SVMBS picnic. All faculty, staff, graduate students, post docs, visiting scientists, professional students and undergraduates and their families are invited to attend the 2nd Annual SVMBS Picnic on Saturday, Sept. 30, 2017, from 4 pm - 7 pm at the Antelope Park picnic shelter. We will be at Shelter #1 on Memorial Drive, which is covered in the case of rain. Please bring outdoor games and lawn chairs. SVMBS will provide water, tea, plates, cups, napkins, plastic ware and condiments. Dustin Loy and Steve Johnson will man the grill(s) with hamburgers and hot dogs. We ask people to bring a side dish or dessert. Please RSVP by noon on Friday, Sept. 22, 2017. The second item of business was the first “Flash Talk” next month. Dustin Loy will present sometime during the week of October 9th or 16th (fall break is October 16-17t). The idea is to do this over lunch and provide either a free meal, have a pot luck or have people bring a sack lunch. A Flash Talk was explained to us as an hour session where people get together and talk about a topic. The presenter does a quick talk and then people interact and discuss the topic. This is NOT supposed to be a PowerPoint seminar presentation. We are planning to have two each season with all areas eventually participating in a talk: VDC, VBS, Virology, GPVEC and MARC. More details to come in the near future. The last item of business was to find a replacement for Dr. Carlson on the SVMBS Workplace Culture Task Force. Dr. Roberto Cortinas was suggested as a replacement and he gladly accepted the position. We will still plan on meeting once a month to discuss School events, issues to fix/solve, suggestions/ideas/questions from workers, etc. The Workplace Culture Task Force (WCTF) met on Thursday, November 3, 2016, with Kristen Reynolds, Mike Carlson, Denise Zinniel, Steve Johnson and Dustin Loy in attendance. Holiday Party. Donna Bode gave us an overview on how this event was handled over previous years. This year's party will be held on Thursday, December 15, 11:30-1:30 p.m. Hy-Vee will cater again this year: meatless red sauce lasagna, roast beef, mashed potatoes/gravy and garden salad. Everyone will be asked to sign up to bring an item to share (side dish, dessert, drink). Also, there will be a white elephant gift exchange. More details will follow in early December. We will send out a Google survey the last week of November asking for everyone to RSVP. Finally, Dr. Kelling has approved comparable funds for GPVEC so they can conduct a holiday party at their office. SVMBS Newsletter. The newsletter will continue to be put out quarterly; therefore, the next one will be in February. If you have any new items to add, please let Marcia Oetjen know by email (moetjen1@unl.edu). In the most recent issue, there were many good pictures from the cave tour and picnic in early October. This event was very well received and attended. Thanks to everyone for the help in making it a success. Message Board and Suggestion Box. Marcia Oetjen has added a direct link to the online Suggestion Box. Look for “Suggestion box for faculty/staff” under the "Home" tab of the SVMBS website. In addition, the red suggestion box is still located in the VDC breakroom on the table. As you can see, these resources have not been utilized for many months. Please remember that our task force can be more effective if we have suggestions from everyone. IANR Holiday Staff Luncheon.This event is on Monday, December 7th in the East Campus Union. You can RSVP by going to this webpage (http://research.unl.edu/events/event.php?eventID=2238) to RSVP. Question of month: Do you think the work culture has improved over the last year? Please reply using one of the following: the Suggestion Box in the VDC breakroom, the Online Suggestion Box, or email to one of the WCTF members. The Workplace Culture Task Force (WCTF) met on Thursday, September 1, 2016 with Kristen Reynolds, Mike Carlson, Denise Zinniel, Steve Johnson and new member Shi- Hua Xiang in attendance. NE Center for Virology Representative. We are happy to announce Shi-Hua Xiang as the newest member to the WCTF. We are still looking for a staff member/graduate student/Post-doc volunteer. Fall Picnic. The picnic will be located at Antelope Park on Saturday October 8th from 4pm to 10pm. The School will be providing hamburgers/hot dogs with everyone bringing a side dish. We will also organize some games with washer toss, ladder ball, bean bag toss, etc. If you happen to have one of these games at home please bring it to the picnic. We are planning to invite all current faculty/staff/graduate students as well as retirees and emeriti faculty. You will get a google survey by email. If you don’t, please let someone know. Blue Blood Robbers Cave Tour. You will have the opportunity to attend this tour the afternoon before the Fall Picnic (October 8th at 2:00pm). The tour would cost $10 as this is a “private” event and it would take a little over 30 minutes. I would need to know a head count before September 30th. Proceeds of tours go toward maintaining Robber’s Cave or donated back to our community. Extra information can be found at their website. You will get a google survey by email. If you don’t, please let someone know. Strengthfinder Team Session. We want to make everyone aware of this opportunity provided by the University. IANR has adopted a strengths-based development approach to ensure employees feel fully engaged in their work and to help areas operate more effectively. This resource will be beneficial to help you identify your strengths and therefore assist in filling out the new evaluation forms. We will try to have a brown bag lunch meeting in the near future. WCTF Website. With help from Marcia Oetjen and Barb Banks, we finally have a message board on the SVMBS webpage and it looks great. Please take a few moments to check it out. If there is a specific topic that you would like to see listed, please let anyone on the WCTF or Marcia know. You will need to be logged in to your UNL account to be able to post anything and your name of course will be associated with the post. This will definitely be an easier way to have comments/suggestions among the School. Yammer. 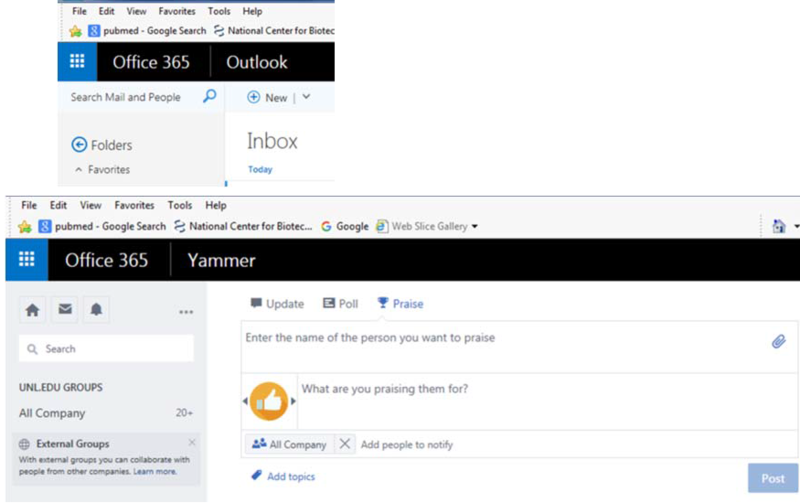 When you go into Outlook Express and click on the nine dots in the upper left hand corner, there is a tool called “yammer”. This is great way to praise someone for doing a great job. This can be sent to a whole area or just a few individuals. Please take a few moments to check it out. Lincoln Ale Trail Groupon – Please let us know if you would be interested in this event. This special can only be used on a Wednesday or Thursday night. Extra information can be found at this website: http://www.grouptherapybiketours.com/Tours.html. Tours. We are trying to coordinate a tour of the football stadium in the Spring. We will keep you posted on details in the future. The Workplace Culture Task Force (WCTF) met on Wednesday, July 27, 2016 with Kristen Reynolds, Mike Carlson, Denise Zinniel, Steve Johnson and Dr. Clayton Kelling in attendance. Dr. Kelling agrees that the WCTF has an extremely important function to help improve the culture in the School. Work Climate Survey. We briefly discussed this topic coming to the conclusion that “Creating a collaborative environment will mean that faculty and staff are provided opportunities to come together regularly on professional and personal basis.” Therefore, this will be our primary focus for the immediate future. Going on the Robber’s Cave Tour and eating at their restaurant. I have placed an information sheet next to the comment box with more details on tour times and menu. If you are interested in attending, please email me (dzinniel2@unl.edu) or just put a note in the box with date (Monday, Wednesday, Saturday) and preferred time. Of course we will have to work around football Saturday’s but let’s try to get this accomplished within the next two months. I have heard about this on the news but have never gone yet. Starting a “Game Group” over lunch. This could be as simple as playing cards, a board game, working on a puzzle or playing online apps where people interact (words with friends, scrabble, etc.). Once again, please contact me or leave a note if interested in getting this going and I can help organize a group. I know that I could donate a few games to leave in the breakroom. WCTF Web page. Located under the Home tab on the SVMBS website. Marcia Oetjen, with help from UNL, is still trying to find a message board that will work on the page. She did comment that people will probably need to login before posting a message. Hopefully, we can launch this in the next month. Nebraska Center for Virology Representative. The WCTF voted to have a faculty and staff member from NCV on this task force. It was mentioned that we may need to elect a graduate student/Post-doc based solely on the limited number of staff. Dr. Kelling will be sending out an email soon dealing with this issue. UNL–GPVEC Communication Issues. Steve Johnson had a meeting to try and fix the audio/video problems we are having with the large classroom (145 VBS). The audio solution has been improved some by buying a new microphone. We are still waiting on the quote to help solve the bigger issues. Please remember that if you are a speaker or are in charge of a speaker, stand directly in front of the microphone on the podium. It is nice to move around the room to interact with the audience, but you are now not seen on the video or heard by GPVEC. We need to keep them in mind also and respect their enjoyment of the speaker. A field trip to the Edgerton Explorit Center (Aurora, NE) - exists to instill and nurture in all people age 2 to 92 through exciting activities and state-of-the-art programming the joy of scientific discovery and exploration. Branched Oak Lake (outside Lincoln, NE) - getaway to fish, boat, picnic, etc. Breakroom usage. It was discussed about expanding the VDC breakroom to get more people interacting in one space. This will also assist with having more seating for Potluck gatherings. Please remember that these are not just for VDC personnel as everyone (faculty, staff, students, etc.) is invited. It was suggested to advertise these events more with flyers in the other buildings and emails. The new VDC building will have a room that opens up to an outside patio, as well as have outdoor seating areas in front of the building. Of course these options may not become available until the VDC construction is complete. Professional development. The WCTF would like to encourage people to attend activities for professional development as much as possible. This includes seminars/training at UNL, traveling to meetings (e.g., AAVLD, CRWAD when appropriate and feasible), giving presentations, touring other Departments, etc. If there is anything you would like to attend, please bring it up to the WCTF. Tours. We are trying to coordinate tours to other School units (VDC, VBS, NCV and GPVEC). This would give everyone a chance to interact with students, staff and faculty in order to learn more about their job/research and the facilities/equipment they utilize. We will inform you of more specific details in the future. The Workplace Culture Task Force (WCTF) met on Thursday, June 2, 2016. Kristen Reynolds, Dr. Dustin Loy, Denise Zinniel, Steve Johnson and Dr. Kathy Whitman (through Adobe Connect) attended. NOTE: Please remember that the WCTF will only be effective when we receive comments and suggestions from all faculty and staff in the School. EVERYONE PLEASE GET INVOLVED! Work Climate Survey. The overall comment from the committee was that the comments from the online SVMBS Work Climate Survey were very general. The main conclusion was that trust was a very big issue. People answered that they trusted their supervisor more than they did one another. Why? The group decided to wait until the July meeting for the new interim department head to provide guidance/recommendations on how to address these issues. Comment Box. We have placed a comment/suggestion box in the VDC breakroom (146 VDC). Rest assured that only the committee will read these messages. It was determined to ask a monthly question to try to get more feedback and responses from everyone. The question will be placed on the outside of the box after the committee meets every month. This month's question is: If the WCTF organizes a gathering, are you likely to attend? If yes, do you have suggestions? Unfortunately, this committee has no funding so certain events would need to be paid for by you. Also, most events would probably occur after hours and on the weekend. The first suggestion was the escape rooms that have been extremely popular lately. I have placed an information sheet next to the comment box with more details and pricing for each business. If you are interested in attending one of these, please email or just put a note in the box. WCTF Website. This web page is on the SVMBS website under the Home tab. We feel that the format looks good and will serve our purpose. If you have any ideas to make it better please let us know. Marcia Oetjen will assist in adding these meeting minutes as they become available. She is still trying to find a message board that will work on the page and be easy for people to use. The one that the university makes available is not user friendly at all. Roxane Ellis has provided her some suggestions to check out. New Employee Tours. The WCTF will look into conducting tours for new employees. Since each group is represented on the task force, it would be easy for task force members to talk specifically about their area. This topic brought up the idea of having someone from virology (Morrison Building) give tours in that building and also possibly to be on the WCTF. This will be mentioned to the interim department head. UNL–GPVEC Communication Issues. Steve Johnson will have a meeting with Tim McPherson (outside vendor) to determine potential fixes to the audio/video problems we are having with the large classroom (145 VBS). This will not only improve our conference and seminar experiences but also in teaching classes. Dr. Loy stated that the rooms in the new VDC are already "designed with teleconferencing in mind" with state of the art audio/video devices that will be available for use once the construction is completed. GPVEC breakroom. Dr. Whitman has proposed the idea of having a breakroom/commons area at GPVEC but she has not heard a decision. The Workplace Culture Task Force (WCTF) held its first meeting on Thursday, May 5, 2016, with all members and Dr. Donald Reynolds in attendance. Denise Zinniel was elected chair for the group. Future meetings will occur the first Thursday of every month throughout the summer. This schedule will be re-evaluated in the fall and may change to accommodate teaching schedules. Meetings will be structured to have the School director present at every other meeting. This will give the WCTF a chance to fine-tune ideas and suggestions before presenting recommendations to the director. Rest assured that if a recommendation is time sensitive it will be handled in a timelier manner. Please remember that the meetings are not open to everyone, and you are always welcome to offer suggestions and feedback to any WCTF members. Determine how to best measure whether the overall workplace culture is improving. The main suggestion here was to conduct confidential surveys, but more brainstorming in future meetings is needed to determine the best approach to this complicated task. Recommend future activities. The proposed ideas included having a tour of GPVEC, conducting a field day at UNL, providing a tour of the new VDC once it is completed and social outings. These ideas will be looked into further, with input being requested from all employees at a future date. Develop a plan for how to communicate plans/recommendations with everyone. In order to give everyone flexibility in having their suggestions/ideas heard, the WCTF is exploring the possibility of adding a message board to the SVMBS webpage (Marcia Oetjen and Roxane Ellis will assist with this). In addition, a good old-fashioned suggestion box will be placed in VBS (exact location and date of availability will be announced later). Evaluate systems that will improve the quality of distance communications. GPVEC raised concerns about the quality of the current Polycom communication devices used during seminars/meetings. Sometimes it is very hard to hear everything that is being spoken. Other systems will be evaluated and researched to hopefully improve this important issue. You are always welcome to send suggestions and feedback to any member of the task force.